Little is known about genetic diversity and geographic origin of wheat landraces from Oman, an ancient area of wheat cultivation. 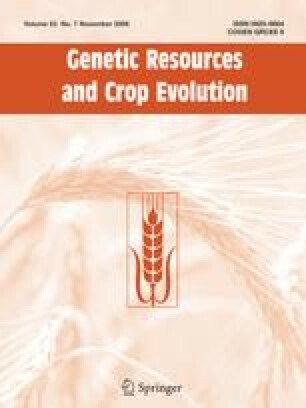 The objectives of this study were to investigate the genetic relationships and levels of diversity of six wheat landraces collected in Oman with a set of 30 evenly distributed SSR markers. The total gene diversity, (H T), conserved in the three durum wheat (Triticum durum desf.) landraces (H T = 0.46) was higher than in the three bread wheat (Triticum aestivum L.) landraces (H T = 0.37), which were similar to Turkish and Mexican bread wheat landraces calculated in previous studies. Genetic variation partitioning (G ST) showed that variation was mainly distributed within rather than among the durum (G ST = 0.30) and bread wheat (G ST = 0.19) landraces. Based on modified Rogers’ distance (MRD), the durum and bread wheat landraces were distinct from each other except for a few individuals according to principal coordinate analysis (PCoA). One bread wheat landrace (Greda) was separated into two distinct sub-populations. A joint cluster analysis with other landraces of worldwide origin revealed that Omani bread wheat landraces were different from other landraces. However, two landraces from Pakistan were grouped somewhat closer to Omani landraces indicating a possible, previously unknown relationship. Implications of these results for future wheat landrace collection, evaluation and conservation are discussed.